For Christmas Hedy got a treadmill. She’s a sturdy, energetic dog and I’m a 63 year-old lady who lives in a neighborhood with very steep hills. Even though I walk her usually twice a day or more, it isn’t enough to burn off the energy of a three-year-old Lab bred for stamina and strength. I figured Hedy would be good on a treadmill because I’d seen “Sniff, the Movie,” with its collection of fascinating dogs and an extraordinarily well-done and informative section on guide dog training. In one scene the guide dog was on a treadmill. The first day, I started Hedy on a slow speed with her leash loosely draped over the control panel. She wasn’t the slightest bit nervous, and eagerly ate the bits of raw carrot I gave as incentive for her to keep walking. She got lots of praise and attention too. 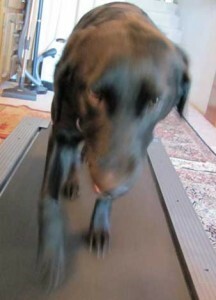 I soon discovered that Hedy didn’t need a leash to keep her on the treadmill. As soon as she heard the little beeps that signaled that the machine was on, she’d come tearing down the stairs and jump up on the belt, ready to go. We quickly built from 5 minutes to 20. Every day she walked, and every day she was just as enthusiastic about it. When I stopped the machine at the end, Hedy refused to get off. She loved it. I, on the other hand, was getting pretty bored sitting on the floor in front of the treadmill cheering Hedy for walking. She was doing so well—walking steadily with head down, ears floppy, doing the job. 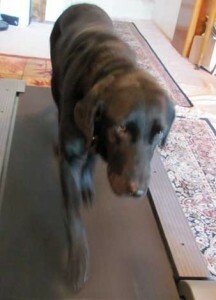 Even when she was distracted by the cat, forgot to walk and was carried off the back of the treadmill, she just jumped back on the moving belt and resumed her walk. After three weeks of cheering the walking dog for 20 minutes straight, I decided to combine Hedy’s exercise with a task for me. I was trying to memorize the words for one of my songs and, because I can be very wordy, I was having trouble remembering the order of the phrases. Hedy was walking along as usual. I got up to retrieve the lyrics from the piano just a few feet away and Hedy got off the treadmill. I coaxed her back on. She walked. I gave her a bit of carrot and waited till she was walking well and then looked at the paper. Hedy got off the treadmill again. This happened a few more times until she simply refused to get back on. There had been other times that I had to get up to answer the phone or something, and Hedy always got off, but got on as soon as I was back in place. Now she was getting off every time I raised the paper. I’ve been thinking about this. I’m not a particularly good multi-tasker. Like my dad, I have a severely one-track mind. In fact, I can have laser-like focus when I’m working. The quality of whatever I’m doing goes down if I try managing more things at once, but I figured I could memorize lyrics and give Hedy her carrot bits without either task suffering. Apparently Hedy didn’t think so. I took December off—to grieve, regroup, and have it out with God. When January came, I was easing into work. Then Dan set up my website and started coming up with ideas that sparked things I’d been wanting to share for decades. I was writing furiously, excitedly. The last things I’d written were obituaries and eulogies. It felt so wonderful to be sharing the tender details of life, the stories of friends, the pictures I’ve wanted to show. And Hedy, who had been my comfort and companion through all the hard stuff, was the subject of my posts, but not the object of my attention. Today, as I sat in front of the treadmill, I looked at Hedy’s well-shaped, smoothly moving legs; her sweet little nose; her calm, brown eyes. Most of the time I can’t see her eyes—all I can see is the shine of her nose—but in that room, sitting at her height, I see her expressions. She’s looking at me, then glancing at the bowl. She’s checking to see if I’m pleased. “You’re walkin’ so good!” I told her (grammar not being an issue when you’re talking to a dog). I thought of my previous Lab, Velvet, who was almost unable to move at the end. Was it such a drag to spend 20 minutes of quality time with my very own guide dog? She’s not just a mobility tool; we’re a team. It’s such a privilege to have this unique relationship with another being. Do I really want to miss the fullness of it in favor of getting a little more done? My parents were always so busy, but at the end they just wanted time with me. With Hedy, I don’t have to wait till the end. I can watch her rhythms and absorb the sense of her. Isn’t that what makes soul mates? Sappy ending. It’s true, but trite. We all know that we need to appreciate the people we love and probably miss out on deeper times because we’re busy. I knew this post wasn’t going where it needed to be. It hadn’t reached the truth of the matter. But I just couldn’t see it. At 11:00 p.m., I gave up and headed off to bed. This morning it hit me. I was sitting at my table, eating a breakfast of savory rice with small bits of free-range chicken with my favorite praise songs on the stereo and the windows giving the whole room lovely light. I was thinking about this post. I was wondering if I should check my email. I flashed on a picture of me sitting at my computer, balancing my nice breakfast on my lap, shoveling mouthfuls in, chewing without tasting while I clicked and moused and answered. And then I knew what it meant. It wasn’t about the dog. It was about being present. Why do people like video games or white water rafting or jumping out of planes for fun? When you’re fully engaged you can’t think of anything else. You’re in the moment, and in the moment is where you feel fully alive. I’m rarely in the present. I’m either reviewing memories for books or thinking about the next thing I have to do. I have so many books in the queue that, when I finish one, I barely stop to celebrate before I’m into the next. I’m rarely working on only one thing. No wonder I’m tired! No wonder I keep forgetting to shut off the stove! But Hedy—she forces life on me. I have to take her out to relieve. Several times a day I see daylight. I walk. And when she’s walking, head down, ears soft, she wants me there too. What is it all about? Life doesn’t have to be boring trudging on the treadmill. When I’m present, paying attention, I begin to notice nuance, shades of sound, characteristic movement, unique style. Then Hedy raises her face and I see the look in her eyes that is her connectedness with me alone. I have given her my time. I have done nothing else but be there with her. Present. And that is my rest and my reward. I resonate with the idea of being there. Living with purpose makes such a differene in experiencing pleasure or just putting in time. Celebrating life is the act of being present, rejoicing in how moments, people and loved ones come together. Hedy, your little loved one, is always present for you, Carolyn. What a blessing! You’re so right, Mary! Hedy puts me into the present just as children show us what it looks like to experience the world with wonder. Hedy is always in the Now. And she drags me back into it over and over. In a profound sense, she’s being more than a guide for a mostly blind lady; she’s helping me to see—and Be.